This series explores love; the ultimate act, the ultimate art. Of what do we know of a father’s love – be he Father of flesh, or “Our Father, who art in Heaven…” We, children of the Almighty Father, at once worthy of paradise – Eden, but broken rules drew father’s ire; disobedience his punishment: banishment from his Garden. Adam and Eve, tragic tale aside, what lessons did we learn of Fatherly Love in Eden? If earthbound fathers are, in essence, apples fallen, but not too far from the Tree, then Old Testament lessons of Fatherly Love seem clear. Father carries keys to paradise; his expectations begat judgment, obedience earns his favour, disobedience his wrath. None would argue that Patriarchal doctrines have long dominated spiritual behavior on the planet. Believers believe in a father who watches over all as children. But questions, even paradox persist, such as why Father Almighty would allow suffering to afflict his children, or why an all-loving Father would show favor to one child over others – citing Genesis 6-9 – Noah being spared while all of humanity perishes. Poetic Irony is that the paradox of Fatherly Love begins at Mother. Before knowing even God, a child knows only mother. Her warmth and tenderness, her comforting attention, her selfless forgiveness, and her unconditional devotion become our genetic reference to the meaning of love. But if this is love, then how can it also be conditional, how can it be tied to living up to the expectations of another who casts judgment, and how can it be justified that love needs to be earned, or must be deserved? The heart within us may never draw attention to this perplexing contradiction – Mother’s Love vs. Father’s Love – it simply accepts that father’s love is by nature, conditional. A father may lack nothing of warmth, support or nurture for his children, but psychologists such as Erich Fromm – author of The Art of Loving – share that the core principle of fatherly love is, well, biblical in tone: “I love because you fulfill my expectations, you obey my rules, and you tend to your duty.” Obedience is the main virtue of fatherly love, disobedience its greatest sin, and withdrawal its most damning punishment. Depending on perspective, the mercurial nature of Fatherly Love may seem like some oversight of nature, or a flaw in the parental code, yet the ability of father to disengage or engaged, dependent on a child meeting expectations, grants said child a measure of control. Meaning, should son or daughter ever stray or disappoint father there remains hope of returning into his favor through future deeds. In sharp contrast, a mother’s unconditional love is either fully on or fully absent. Should love for her child not grace her heart naturally, there is no deed that can be done, no wrong that can be undone, to ignite it within her. Around age five or six, even the child most secure in the all-enveloping love of mother develops a desire to win father’s praise, and avoid his displeasure. Whereas mother represents nurture in the natural world, father serves as authority on the manmade world of logic, thought and invention; of the impossible made possible through imagination; of risk and its rich rewards; of order out of chaos; of law and consequence, and of discipline and the release found in adventure. I am not a parent, father or mother, but I, like you – I hope – am a child who believes the ultimate achievement of any loving parent is to have raised into adulthood an individual who has developed within their soul and character the core essence and principles of both motherly and fatherly love – primarily a capacity to love, a value for justice toward their fellow man, and a faculty to forgive…and to continue loving. A metaphor for Fatherly Love is in watching a father play with his newborn. As mother, family and friends coddle the seeming fragile toddler in safe embraces, it’s father who winsomely tosses the tiny soul into the air to witness the glee and wonder in the child’s eyes as it comes to rest in his hands. It’s father saying, my child you are safe; for you, the sky is no limit. Let me acknowledge that in our modern would and in our modern wisdom, traditional behaviors/expectations of mother/father have shifted – fathers are stay-at-home while mothers discipline and teach commerce skills. That being reality, human dna still and will always remain beneath human behaviour, immune to our social engineering. 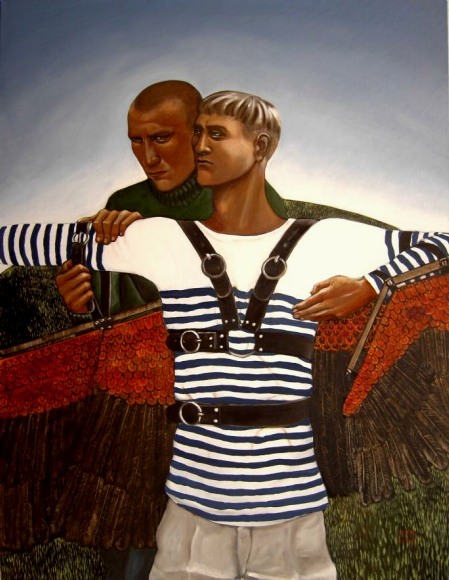 Image by Erika Meriaux “Daedalus and Icarus“. The wisest decision I’ve ever made was choosing the right father for my children.